As the name implies, this small estate is the fruitful partnership of Western Australian Karen Turner and Eastern Frenchman Emmanuel Pageot. Together their combined experience in the wine world includes stints in Australia and South Africa, Portugal, Italy and France (both worked at Chapoutier). Their love of biodynamics led them to apply these principles to ten small parcels they now own near the town of Gabian. Almost 5h of varied soils, from gravel and schist, sandstone and basalt, to clay and limestone, provide freshness and purity, complexity and balance. These are natural wines, certified “biodynamic” – true “table” wines, straight, honest, and worthy of top-flight gastronomy! ‘Le Blanc’ Coteaux du Languedoc, 2014…..Happy marriage of 80% roussanne and 20% marsanne – rich and full-bodied with notes of honey and white flowers. ‘La Rupture’ Vin de France, 2014…..Pure energetic, barrel-fermented sauvignon blanc, unusual for this latitude – from a north-facing gravel slope – amazing vibrancy and minerality. 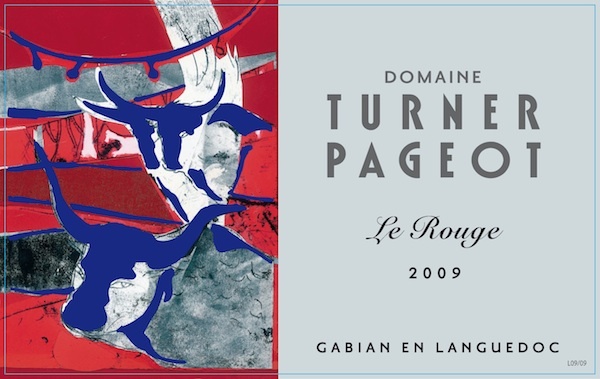 ‘Le Rouge’ Coteaux du Languedoc, 2013…..Schiste (planted to 80% Grenache) and clay and limestone (20% Syrah) guarantee a genuine wine, scarlet and spicy, bright yet brooding. ‘Carmina Major’ Coteaux du Languedoc, 2013…..Grand wine with long ageing potential, blended from the best barrels of Syrah 70% and Mouverdre 30%. Perfect equilibrium between concentration and finesse thanks to north-facing vines on clay and limestone soils.